The Children of Coyote can wear just about any face they like, wander wherever they want in this world or the next, and generally outsmart anyone unlucky enough to cross their path. Some say the werecoyotes might even be too clever for their own good but who listens to people like that? 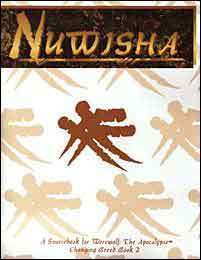 Nuwisha is one of the popular Changing Breed books for Werewolf. This character book spotlights the werecoyotes, the tricksters par excellence of the World of Darkness. Learn their ancient tales and the secrets that they alone know about the coming Apocalypse.